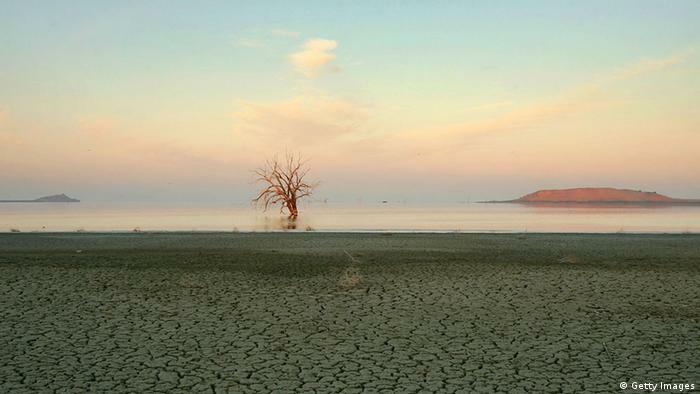 A new report published by the UN Intergovernmental Panel on Climate Change warns of rising temperatures and says global warming could have devastating effects as the risk of heat waves, floods and droughts increases. After being closeted behind closed doors since Monday (23.09.2013), scientists and government representatives of the 195 UN member states came up with a 31-page summary of the report that's well over 1,000 pages long. According to this brief version published on Friday (27.09.2013), prospects are even more pessimistic than scientists had projected in 2007. The Intergovernmental Panel on Climate Change (IPCC) says it is 95 percent certain that mankind caused more than half the warming observed over the past 60 years. In 2007, the IPCC had rated its conviction at 90 percent. Humans produce an incredible amount of carbon dioxide (CO2) which heats up the atmosphere. CO2 levels continue to rise - just in March, the National Oceanic and Atmospheric Administration in the US had recorded new peak levels. Sea levels are also expected to rise at a much faster pace. 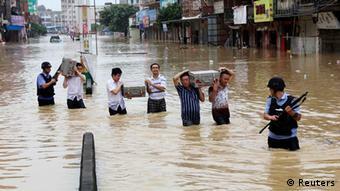 The IPCC projected sea levels would rise between 26 and 82 centimeters (10.4 and 32.8 inches) by 2100. "We know much more about the reasons for rising sea levels now than we did a couple years ago," said climate researcher Stefan Ramstorf of the Potsdam Institute for Climate Impact Research. "Measurements show that both large continental ice sheets in Greenland and the Antarctic are increasingly losing ice masses." Rising sea levels are a threat to flat coastal regions. Global warming is going to continue, the report said. Global average temperatures could rise by 1.5 to 4 degrees Celsius according to different climate scenarios. The IPPC also warned about missing the 2-degree limit that countries set as a target in climate talks to avoid the worst impact of global warming. "To steer humanity out of the high danger zone, governments must step up immediate climate action and craft an agreement in 2015 that helps to scale up" efforts to curb greenhouse gas emissions, executive secretary of the UN Framework Convention on Climate Change, Christiana Figueres, said. Even though global average temperatures haven't risen in 15 years as predicted, it doesn't mean climate change won't have devastating effects on Earth. That's what most climate researchers pretty much agree on. Mojib Latif of the Geomar Helmholtz Centre for Ocean Research in Kiel has been arguing for years that oceans might be responsible for stagnating temperatures, because deep sea areas are able to absorb heat and store it. "That's why we haven't been able to detect a rise in global surface temperature even though the climate system is heating up." Certain severe weather phenomenon like heat waves, flooding or thunderstorms are going to increase in the future. IPPC scientists expect humid regions to get more rain while dry regions will continue to get even less water. However, they can't say for sure if their models and simulations are going to reflect reality in the future. Climate calculations are highly complex. Even though scientists have learned a lot about correlations between oceans, sea current and atmosphere, there are other factors that come into play as well - for instance the ocean's capacity to store heat. Scientists failed to include this sufficiently as they calculated their models. Now they have realized it's the ocean's storage capacity that's responsible for stagnating global average temperatures. In the scientific community, it's standard procedure to rework models and simulations. However, the public doesn't appreciate apocalyptic scenarios predicting an immediate end to life as we know it - only for scientists then to revoke them. "We lose credibility," said climate researcher Hans Storch. The IPPC, which was awarded the Nobel Peace Prize in 2007, has lost some of its credibility since it was hit by several scandals: A study about melting glaciers turned out to be unrealistic, and environmental lobbyists helped to craft the IPCC report. As a result the public are more sceptical than before about the claims made by climate scientists. 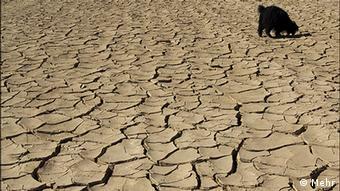 "Only 39 percent of the German population fears climate change. A couple of years ago it was over 60 percent," said meteorologist Sven Plöger at the Severe Weather Congress in Hamburg. European Union Climate Action Commissioner Connie Hedegaard called the IPPC report a wake up call, saying: "The issue is not whether to believe in climate change or not. The issue is whether to follow science or not." "If your doctor was 95 percent sure you had a serious disease, you would immediately start looking for the cure," she added. The IPCC summarizes the most important scientific climate studies of the past years and doesn't make recommendations of its own in terms of environmental legislation. It's up to politicians to draw conclusions. The next climate summit is going to take place in Warsaw in mid-November. Funny - I can remember my dear old Dad telling me that there were too many people in the world and we needed a plague. That was well over thirty years ago when the population was a lot less than today's and we didn't know how badly we were screwing things up. I take no personal responsibilty for anything that goes wrong in this atmosphere. If you are one of the "We" who have done bad things to people, places or things...then well...shame....shame....guilt....guilt...and notty notty. Did you turn your computer on when you wrote that? Then you're at fault. Did you flush the toilet the last time you dropped the Huxtables off at the river? Then you're at fault. Did you drive your car to work this morning? Then you're at fault. Truth be told, the fact that things are getting warmer is plainly true. Mankinds influence on that is a point of contention. I am rubber, you are glue; whatever you say negative to me, will bounce off of me, and back onto sticky old you! carbon20 - that's the thing I can't get past when it comes to the argument about whether climate change is (A) happening, and (B) is man made. Coming from a science based background, I find it hard to fathom how increasing atmospheric CO2 concentrations from a pre-industrial age level of 280ppm to our current 400ppm wouldn't have a measurable effect. We live in a relatively small enclosed system powered almost solely by solar energy, and the amount that remains in that system and isn't reflected/radiated back out drives our weather systems and dictates the climate we live in. Cause and effect predicts that an increase in greenhouse gases has to bring about some change in our atmosphere, and sea level rise, glacial melting, ocean acidification, and extreme weather events all seem to be the kind of things we should be expecting, and indeed are now seeing. I just don't see how you can dramatically and rapidly alter the chemical composition of an atmospheric system and realistically not expect change. I'm an environmental scientist with over 30 years of consulting practice, working for the big guys (BP, ConAgra etc.). They believe in climate change, and I do as well. However, the media and stupid advocates like Al Gore pumped it up SO big, and made it sound so immediate, that they boxed themselves into a big corner. We have had a pause in cooling, likely due to natural causes (the same quiet sun that might whap us with massive solar flares when it comes out of its slumber). "extreme ice" and "chasing the ice"
Agreed, Chuck. The big unknowns are how much CO2 the oceans can continue to absorb, how much damage to marine ecosystems will occur as they become more acidic, and are conditions becoming more favorable for widespread oceanic anoxic events to occur as some scientists have theorized. The process is undoubtedly moderating atmospheric CO2 levels, but they'll rise dramatically if and when the ocean's capacity to absorb it is reached. There's a 97 percent consensus on human-caused global warming in the peer-reviewed climate science literature and among climate experts. There's a 96 percent consensus in the climate research that humans are responsible for most of the current global warming. The 2013 IPCC report agrees with this position with 95 percent confidence, and states that humans are most likely responsible for 100 percent of the global warming since 1951. Yet a new study conducted by Media Matters for America shows that in stories about the 2013 IPCC report, rather than accurately reflect this expert consensus, certain media outlets have created a false perception of discord amongst climate scientists. 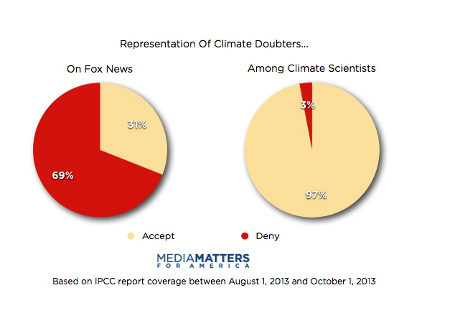 IPCC media coverage vs. the 97 percent expert consensus on human-caused global warming, courtesy of Media Matters. 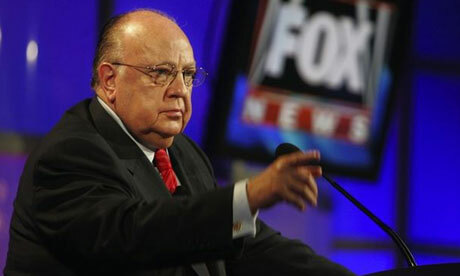 Specifically, politically conservative news outlets like Rupert Murdoch's Fox News and the Wall Street Journal were responsible for the lion's share of the false balance, disproportionately representing climate contrarians in their stories about the IPCC report. Disproportionate climate contrarian coverage on Fox News as compared to the 97 percent expert consensus on human-caused global warming, courtesy of Media Matters. The Media Matters study focused on American news outlets, but similar patterns have been observed in other international media markets. Mat Hope at Carbon Brief reviewed UK media coverage of the IPCC report. Based on the IPCC story headlines he compiled, the politically conservative Times, Daily Mail, and Telegraph gave climate contrarian views disproportionate coverage, unlike The Guardian, Observer, and Independent. Rupert Murdoch's The Australian also heavily featured climate contrarians in its climate stories leading up to the 2013 IPCC report. Because there are so few climate scientist contrarians to choose from, most of the guests casting doubt on human-caused global warming and the IPCC report were not climate scientists. It's important to remember that the scientific evidence has no political bias, which suggests that the disproportionate representation of climate contrarians is a result of the political biases in the media outlets themselves. 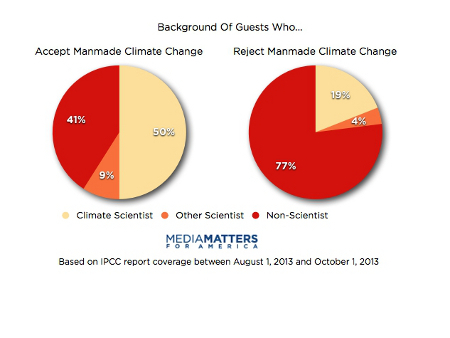 Background of guests who accept and reject human-caused global warming in IPCC media stories, courtesy of Media Matters. 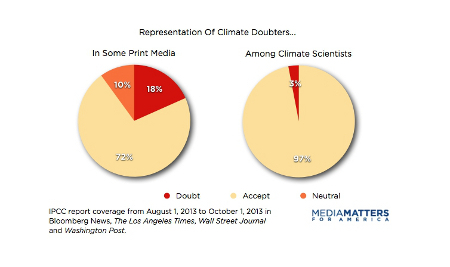 The 19 percent of guests classified as 'climate scientists' in the above graphic is also very generous to the conservative American media outlets. The 19 percent is comprised of Judith Curry, Willie Soon (who has received $1m from coal and oil industry interests since 2001), and Anthony Tsonis (whose research on ocean cycles is entirely consistent with human-caused global warming, but whose views Fox News portrayed inaccurately). This practice is known as "false balance," where the 3 percent of climate contrarians are given a disproportionate amount of media coverage, creating the perception that there is a significant divide amongst climate experts. In their purported efforts to be "fair and balanced" and represent "both sides," these media outlets are actually creating an unbalanced perception of reality. The reality is that 97 percent of climate experts and evidence support human-caused global warming. The findings in the IPCC report are consistent with that expert consensus, as we would expect, since the IPCC report is simply a summary of the body of scientific research. Unfortunately this practice of false balance appears to be spreading to politically neutral media outlets. The BBC has been heavily criticized for its interviews of climate contrarians leading up to the publication of the IPCC report. BBC editor Ehsan Masood attempted to defend the network's false balance coverage this week, arguing that there is a difference between climate contrarians and skeptics, and that it's important to cover the latter to avoid "shutting out dissenting voices." There certainly is a difference between biased contrarians and open-minded skeptics. The problem is that the BBC can't seem to tell the difference. For example, they granted an extensive interview to Bob Carter, a marine geologist with minimal experience in climate science, who works for numerous conservative think tanks including the Global Warming Policy Foundation. In fact, the interview largely centered on the right-wing think tank response to the IPCC report, the NIPCC report, which is neither a legitimate scientific document, nor skeptical. Rather it is the epitome of cherry picking and myth regurgitation. "Very few journalists (at least in the developed world) would give space to those claiming HIV doesn't cause Aids, to flat-Earthers, or those who believe that vaccines make us ill."
Will the BBC begin following every Attenborough program by giving Creationists airtime? Giving space to those like Bob Carter that reject the expert consensus on human-caused climate change is no different. It amplifies the voices of the 3 percent minority and creates the false impression of a division amongst climate experts. As a result, only 45 percent of Americans are aware of the 97 percent expert consensus on human-caused global warming. Media false balance as illustrated in the IPCC reporting by outlets like the BBC, Wall Street Journal, and Fox News is largely to blame for this "consensus gap." This practice of false balance misinforms the public and does us all a disservice. "and he drank like a fish AND he ran with scissors !!! " I happen to agree with you. There are many variable in any given system, and we are one. If any variable is altered, some by just a very tiny amount, then you will have a change occur in the system as a whole. So yes, I do believe that what we do, humans do, have an impact on what is going on. The question is: how much of an impact are we having? Your guess is as good as mine, but I do know we are having an impact. To deny this is to deny cause and effect which is insane. I'm not convinced yet. People used to burn witches, believe in blood letting and shock therapy. However, I think we should err on the side of caution. If we're serious about this then why aren't building codes changing to require passive solar or solar panels? Why aren't businesses closed on Sunday to save energy on lights & heat? I don't believe that most people would make even the smallest changes such as turning off a light or turning their AC off for even a day. This is an uphill battle. Look at the bright side. If the preppers are right.... and ...there is an apocalypse...the grid will go down....global warming will become the great global cooling off period....preppers will be excited because they can practice all of their skills. Everyone will be so embarrassed and bow down to those who knew...the truth...about the future...and prepared properly. For protection...preppers will create mini communities. They will create various compacts and laws...much like those great pilgrims who came to explore and take hold of far off lands on floating ships. These prepper forces will subject anyone who was not able or chose not to prep...to be the new labor force...for the preppers. Power struggles and imbalances will continue on. New thrones will be created. Others will be crushed. The topics of today will be replaced with the same...but different...yet really the same conversations. The unjust and unethical world with a power grid will be replaced with another unjust and unethical world without a power grid...or whatever scenario one's mind can envision. The disgusting and foul agendas of one time period, will merely be replaced with more disgusting and foul agendas of another time. The world reminds me of a huge trash pit. The bulldozers come in to turn over and churn under the trash of the day...to be buried and hidden...from the new trash that will come in tomorrow. Each day is the same....the days become years...and the years become milleniums. One right after another. Costumes and scenery change. Time continues on. Yet...the intellects continue to stay in perpetual limbo. And we are all mortal"
You and I are held captive by the illogical ideology, of this so called planet. Our minds, bodies, spirits and souls are defined and used according to the dictates of negative non progressive intelligence. We are as refugees from other worlds who have arrived in the realm, with no memory of the past, to positively direct and guide us. I do not believe we are in this world...willingly. Meaning; we did not come here; of our own free will and desire; free from threat, duress and coercion. It is my very strong belief, that we are all being held perpetually captive, to a negative life force, that is way beneath our positive intelligence. We are wrongly subject to those who do not have out best positive, progressive and ethical needs and purposes in mind. Yet this negative and obscene power structure is free to dictate how we shall attempt to live in this particular world. A far lower intellect, has some how managed to confuse, lure, trap and hold, positive intelligence hostage; for a very, very long time. An atmospheric prison camp realm; that breaks off into other camps of refugees, subjection, oppression and confinement. We know only what we have been allowed to learn. How much of this knowledge is false? A negative, senseless mindset holds us as mere subjects; we have been devalued, disregarded, demeaned and horribly violated, by this low base collective. These negative ideals and so called sciences are taught and passed on from one generation unto the next. As long as we walk, talk and sing the praises of the collective farces; we are considered in league and one with them. This is what they have instructed and forced upon our majestic minds. This is what they demand of us; unto our destruction, and annihilation. Haven't you ever wondered why individuals are only allowed so many years in this atmosphere? No one can live long enough to say that the past as it is being presented is false. No one alive to be witness to events as they took placed in times...past. This keeps the individuals who are held capitive to the collective farce...perpetually willing to be subject and worship the unjustified killing machine. As mere breeders for a negative intelligence, we own nothing. All individuality is the property of the collective. To disagree is to be a heretic of the worldly refugee planetary system. You speak of children. As a mere breeder, you are nothing more than a Figure Head. You may be addressed as Mother and Father, but that is status in name only. You have no real power, or you could openly take your family and leave this world, through the venue of moral suicide. That is not the case. You and your family belong to the collective. If individuals and families were to see the reality of this horror and say, "No more!" and walk out...it would be the beginning of the end... of the perpetual death march. This planetary collective would fail and fall. To deny this is to deny cause and effect which is insane. UN climate panel blames humans for global warming, as if global warming is a fact instead of a theory or belief. I wonder if that report contains any of the data that was found to be "invented" by proponents of global warming or other data that was found to be "altered" to fit the theory of global warming. When I hear about record amounts of ice in the arctic right now - well, it just doesn't make sense. Those who publicly blame an object for the user�s abuse are promoting irresponsible behavior.